Need some healthy snack inspiration? Fancy a little something for your afternoon cup of tea but don’t want to spend hours in the kitchen? Then these are for you. I whipped them up in only 5 mins and then just chucked them in the oven and they are simple, filling and oh so good for you! However I do feel a bit of a traitor posting this recipe. 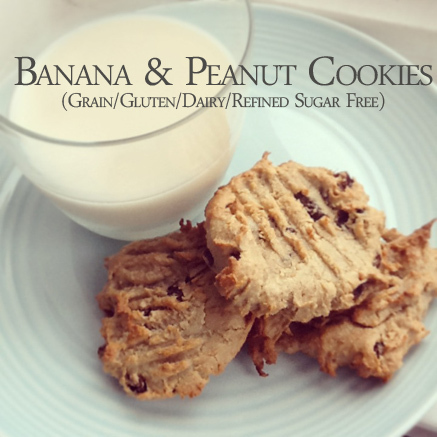 You see my beloved husband is super allergic to peanuts so having made a batch of these super simple, incredibly healthy cookies feels a bit treacherous. Luckily I have lots of lockable tupperware boxes that they can live in and maybe I just won’t tell him I’ve been baking…. These little cookies are also super filling so perfect if you are in a hurry but need something that will give you lasting energy. There is no refined sugar in these (obviously) so you wont end up on a blood sugar spike, and are naturally sweetened meaning they are not sickly sweet. If you want a more sweet taste then feel free to add 1-2 tbsp of honey or maple syrup to the recipe. I have just eaten mine with a glass of homemade almond milk and feel like a happy 4 year old! 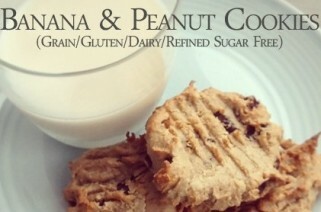 The quickest cookie you can make that gluten/grain/dairy/refined sugar free! Place all the ingredients in a blender/food processor until smooth. The add the raisins and mix in by hand only. On a grease tray place 1 tbsp dollops on tray. 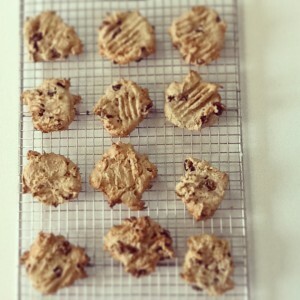 Place in a preheated oven at 180c and after 10 minutes squish the cookies down with a fork until flat. Leave to cook for a further 10-15 minutes or until golden. Feel free to use chocolate chips instead of raisins or any other sort of nut butter if peanuts are a problem for you. What are your favourite cookie combinations?